Crispy Raw Banana or Plantain Fry is a traditionally prepared South Indian dish. Made using very few ingredients, this dry curry tastes delicious. 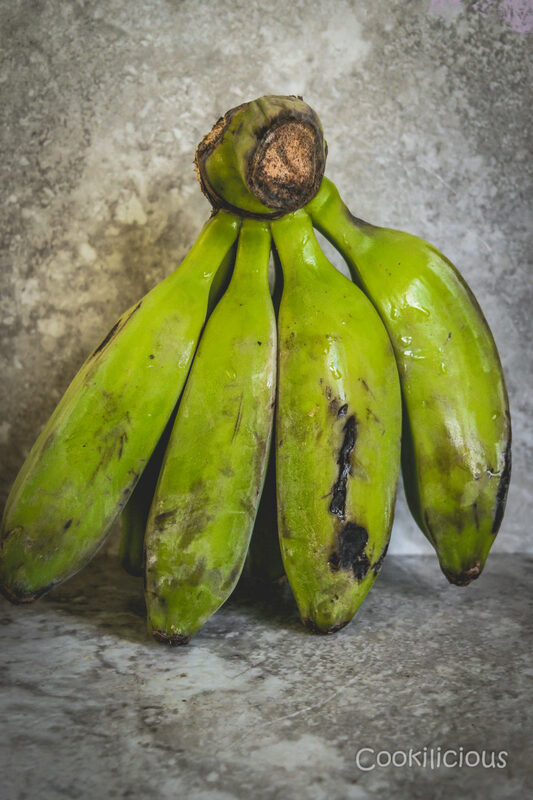 A great alternate way to enjoy cooking banana or plantains in day-to-day cooking rather than just as chips. This roast style curry tastes great with lentil stew/rasam and rice. Being a South Indian, I have a couple of favorite dishes and combos that I swear by. 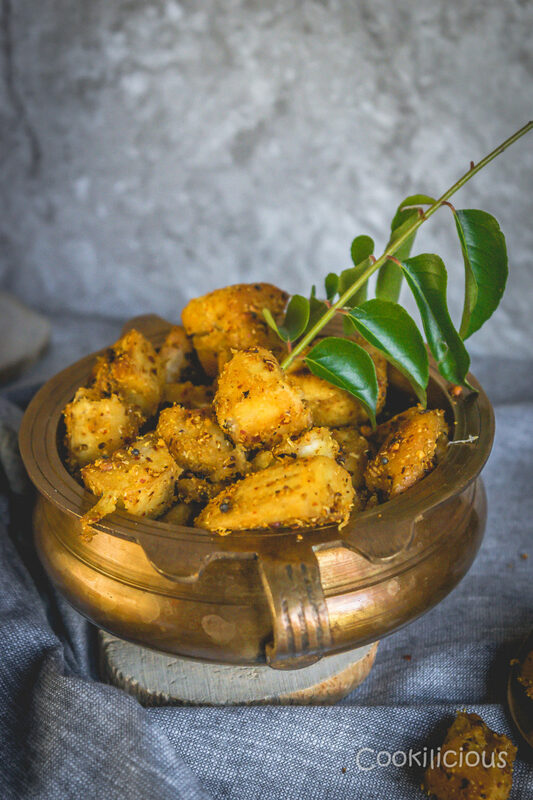 This Crispy Raw Banana or Plantain Fry when served with rasam and rice, it makes the best combo. We call it Vazakai Poriyal at home. 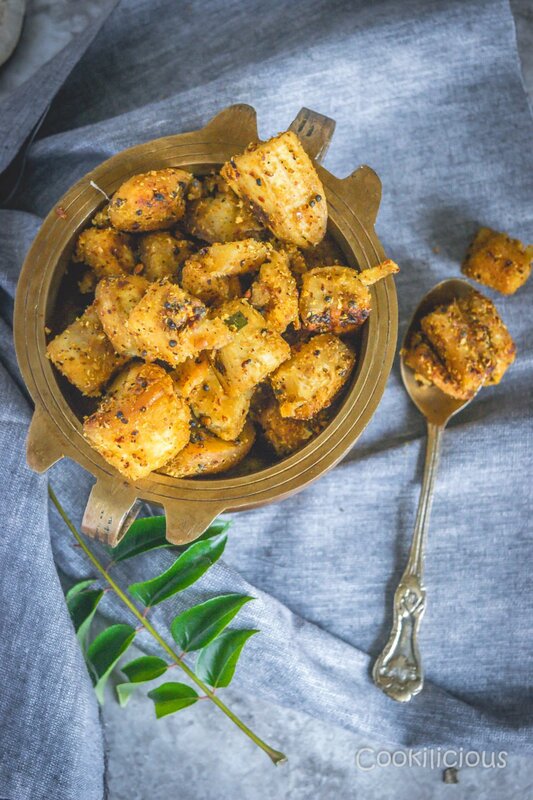 But for the benefit of all non Tamilians, it’s called Crispy Raw Banana/Plantain Fry Recipe. Contrary to popular belief that only Jains cook with raw banana or plantains, we also do. For me, while growing up, the only way I consumed cooking banana was in the form of this curry. But when I entered college and as exposed to Jain food, I was blown away. I got to know that they used plantains excessively in their day-to-day cooking. For them, it acts as a substitute for potatoes which their religion doesn’t permit them to eat. They as a group are vegetarians but also prefer not to consume root vegetables. Barring exceptions, many follow this even today. Every time my friend would open her lunchbox at college (Yes, I am from that era where college kids took lunch boxes from home) and urge me to taste her food, I would get the hint that it has plantains in it. I have eaten pav bhaji, vada pav, bhajiyas, paratha and many more food items made with raw banana and they all have tasted just great. It was almost as if I never missed the potatoes! I still somehow never attempted to replace them in my dishes. I still stuck to what I know and what suits my palate. While we were at an Indian grocery store recently, KR picked up a bunch of raw bananas and put them in the cart. That was his way of suggesting that I prepare this Vazakai Poriyal that weekend. Just the thought made my mouth to water. Both of us love this South Indian curry and really relish it when its made at home. His mom and my mom make the most lip smacking Vazakai Poriyal and we miss their touch when we cook it ourselves.
. Once the lentils become golden, add the chopped plantains, salt and sambhar powder. You can add any curry powder in absence of sambhar powder but this spice powder gives it the authentic taste. Cover with lid and cook till the plantains are done. You can even garnish it with chopped cilantro if you wish. Crispy Raw Banana/Plantain Fry Recipe is ready to be served. Like I mentioned before, one of the best combo to serve it is with sambhar/rasam and rice. 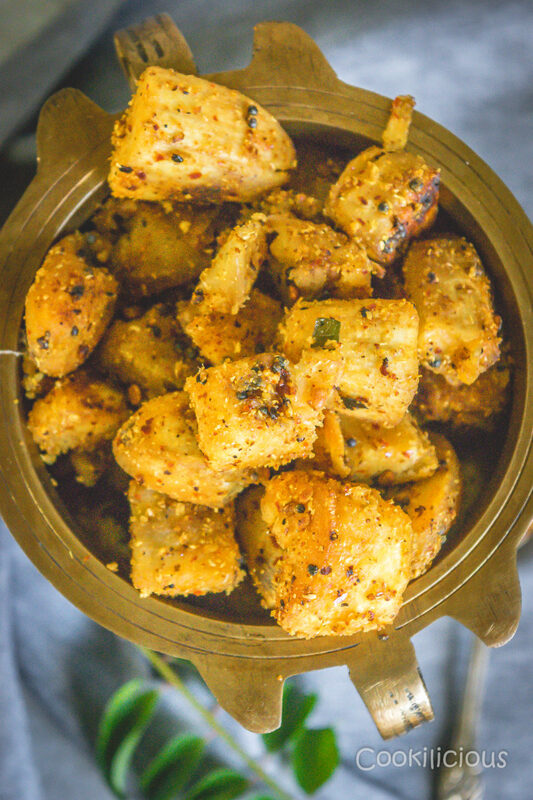 Crispy Raw Banana or Plantain Fry is a traditionally prepared South Indian dish. Made using very few ingredients, this dry curry tastes delicious. 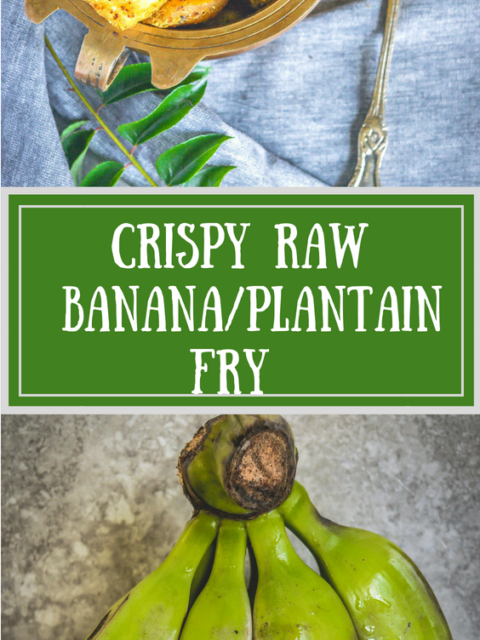 A great alternate way to enjoy cooking banana or plantains in day to day cooking rather than just as chips. This roast style curry tastes great with lentil stew/rasam and rice. Peel the plantains and chop them in medium size chunks. Immerse them in water till you need them This will stop it from blackening. Also, while peeling off the skin of plantain, grease your hands with oil to avoid stickiness. Heat ghee in a pan and once its hot enough, temper mustard seeds. Once they begin to crackle, add asafoetida, urad dal and curry leaves. 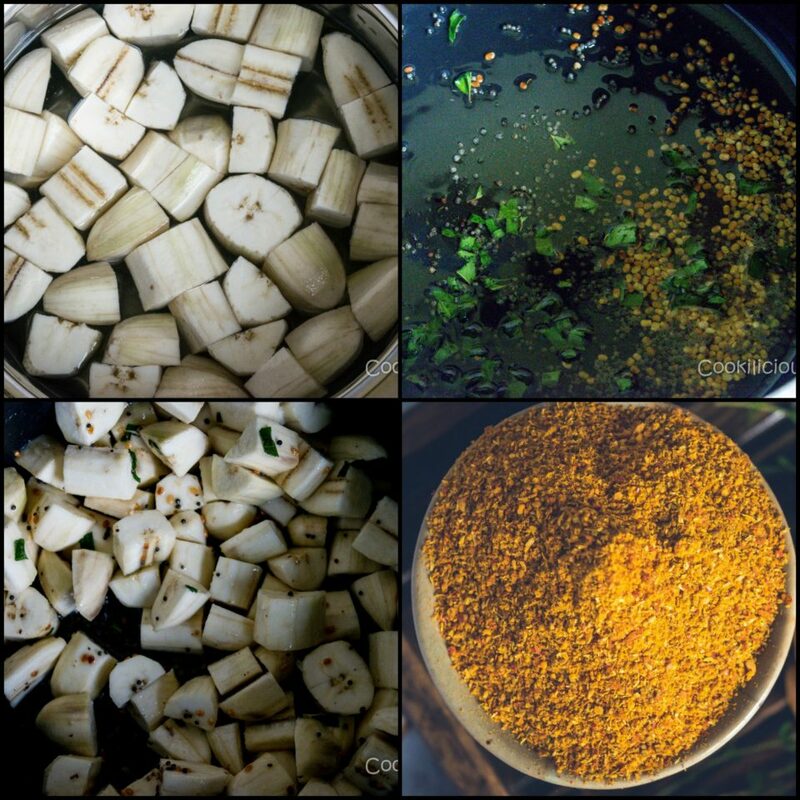 Once the lentils become golden, add the chopped plantains, salt and sambhar powder. You can add any curry powder in absence of sambhar powder but this spice powder gives it the authentic taste. Cover with lid and cook till the plantains are done. You can even garnish it with chopped cilantro if you wish. Crispy Raw Banana/Plantain Fry Recipe is ready to be served. Like I mentioned before, one of the best combo to serve it is with sambhar/rasam and rice. South Indian cuisine is full of flavors. Here are some dishes that I would recommend you to try – Ven Pongal Recipe, Paruppu Usili Curry, South Indian Spicy Potato Fry Curry, Vermicelli Oats Idli, Poricha Kootu (Vegetable and Lentils gravy), South Indian Spinach & Lentils Keerai | Kootu | Curry, Traditional Curd Rice, Avial, Indian Style Veggies Stir Fry | Varuval and Beetroot Carrot Poriyal/Curry. Awesome and quick recipe to make from banana. Great idea too. Keep up the good work.